For Office 365, Outlook 2010+, Google, iCal, Lotus Notes, LexisNexis Time Matters®, Clio, etc. Firms can instantly add all or select deadlines into all users calendars. After adding a matter in LawToolBox365, one click will add deadlines into your calendar and your attorney’s calendars. Deadlines can also be added to a client or co-counsel’s calendar! Click here for video. Works with all versions of Outlook, Google, iCal, Lotus Notes & more! Firms can instantly add all or select deadlines into all users calendars. After adding a matter onto LawToolBox, one click will synchronize deadlines into your calendar or to your attorney’s calendars. Deadlines can also be added to a client or co-counsel’s calendar! 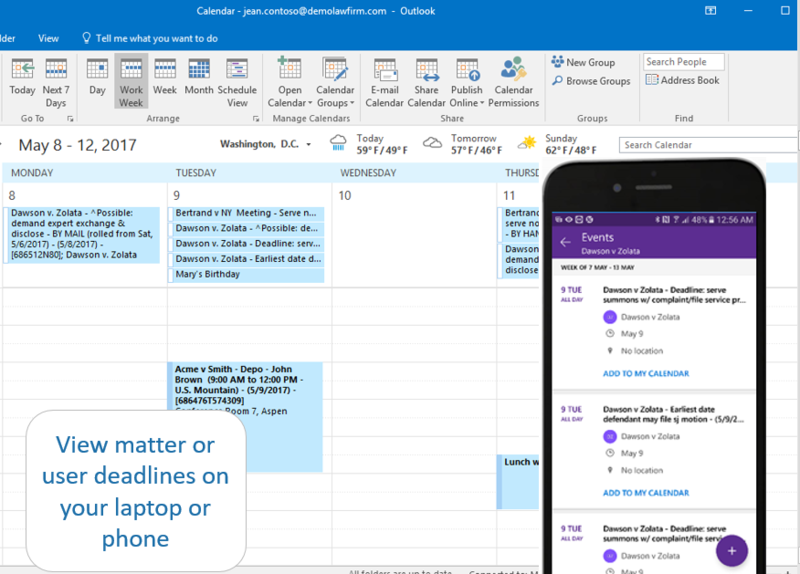 Click here for instructions on creating an Outlook rule or Google filter and click here to create an Outlook calendar filter. Sync software uses Exchange delegate rights to synchronize deadlines to calendars and/or task lists from a single computer or server. Works with Hosted Exchange and onsite Exchange. Pricing below is flat rate pricing based on the number of calendars with sync activated. For example, a firm may have 20 LawToolBox users with sync activated for only 5 calendars. * Sync can be activated on a user by user basis.